It is the tropical signs which are described here. These are not the signs of the constellations. 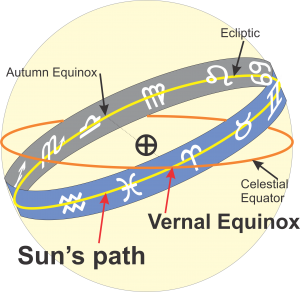 The tropical zodiac is focused on the apparent path of the Sun around the earth, and the signs are discreet 30 degree divisions of the ecliptic divided into 30 degree segments. Each segment corresponds to one zodiac sign, beginning with Aries when the Sun crosses the equator on its journey northward at the beginning of Spring in the northern hemisphere. Western astrology is concerned with life on earth and it is the Sun which governs life on this planet, which together with the earth’s tilt produces the four seasons, which are fundamental to our daily lives. For these reasons the tropical zodiac is used here, not the constellations. The constellations which vary in size. Their gradual drift is often seen as analogous to the drift of the physical mundane world from the perfection of the divine source. In which zodiac sign is your natal Sun placed? In previous eras the signs of the zodiac were not used as a stand-alone description; that is a modern development which can be sourced to the need to sell newspapers. 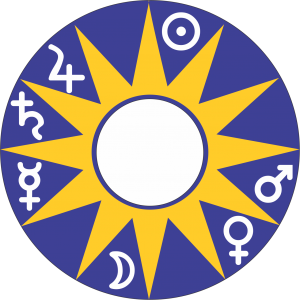 In the modern era the zodiac signs have their own personality descriptions which are familiar to most readers of Sun-sign columns. To obtain precise and accurate answers in horary astrology and interpretations in natal astrology these Sun-sign personality descriptions need to be disregarded. The zodiac signs describe the capacity of the planets to act according to their nature. In some signs one planet will have the capacity to express itself exceptionally well, and another planet will be restricted and unable to live up to its fullest potential. For example Mercury in Gemini is very clear and articulate, while Jupiter in Gemini loses its capacity for a broad perspective and gets tangled in the detail. It is the planets which act and the signs which describe how the planets act. The signs cannot take action. The signs do not move and are fixed relative to the vernal equinox. The planets are like nouns and the signs are like adjectives. The important point is that the signs only describe the planets, like a piece of clothing, for example a jacket, that colours one’s appearance. The jacket cannot act by itself. It is the wearer of the jacket that acts. The same principle applies to the zodiac signs: they only describe how the planets act and behave. The 4 primary qualities are the building blocks of life, and underpin our understanding of the planets and the signs. 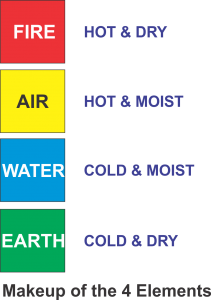 The 4 primary qualities are hot and cold, dry and wet. Hot and cold are the dynamic qualities associated with energy and describe activity, whether it’s active and outward focused, or passive and inward focused. From these 2 fundamental principles are derived wet and dry. Sometimes hot is referred to as warm and wet is referred to as moist. The primary qualities generate each other in the endless cycle of existence. The 4 combinations of these primary qualities constitute the 4 elements: fire earth air and water. Fire is hot and dry, air is hot and moist, water is cold and moist and earth is cold and dry. The 12 signs are divided into 4 groups of elements: fire earth air and water. Sometimes these 4 groups are called the triplicities because each contains 3 signs. Fire signs: Aries Leo and Sagittarius. Earth signs: Taurus Virgo and Capricorn. Air signs: Gemini Libra and Aquarius. Water signs: Cancer Scorpio and Pisces. 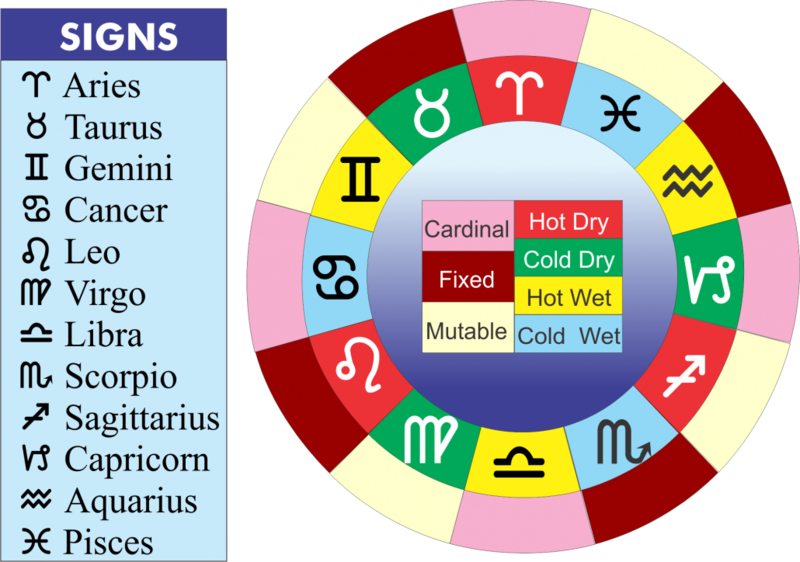 The modes of the signs show how the elements are expressed; following the observation of the seasons. Spring, which corresponds to the cardinal mode, is the glorious flowering and expression plant and animal life. It represents the initial creative surge; the impulse to act and move forward. 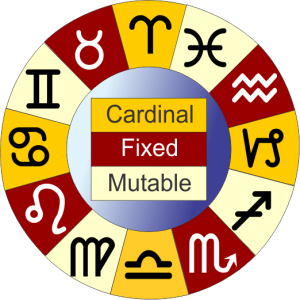 For this reason the cardinal signs are sometimes referred to as the movable signs. The cardinal signs are Aries Cancer Libra and Capricorn. The fixed signs correspond the the height of the seasons, summer and winter, when the energy is relatively continuous with little variation or movement. In the fixed signs the elements are explored to their fullest, from every perspective. This is clear in the case of Aquarius where ideas are looked at from many different perspectives, sometimes giving people with the Sun in Aquarius the reputation for being alternative. The energy of the mutable signs corresponds to the change of seasons. For example in autumn (fall) the heat of summer gives way to the cold of winter, and there is an ebb and flow between these the previous fixed season and the following cardinal season. For this reason the mutable signs, Gemini Virgo Sagittarius and Pisces, represent a mutation and a flux between one season and the next. They have something in common with the season which is retreating and the season which is advancing; and for this reason they are sometimes called common or double-bodied signs. The above descriptions of the primary qualities, which make up the elements, provide a partial description for each sign. When the primary qualities are combined with the mode, we have a deeper understanding of the unique qualities of each sign. No two signs have the same combination of primary qualities and modes. Each is unique. Taurus is a cold dry (earth) sign. Its coldness shows its passive nature and its dryness its desire to stand alone. Its fixed mode adds endurance and determination to these qualities. Gemini is a hot moist (air) sign. The moisture component shows the need to connect with others, and the heat shows the outgoing interactive nature. Its mutable mode adds versatility and a capacity to adapt to circumstances. Cancer is a cold wet (water) sign. Its coldness shows its passive receptiveness and its moisture the desire to connect with others. Its cardinal mode adds a pro-active nature in seeking connections with others. Leo is a hot dry (fire) sign. Its heat show its active creativity and its dryness its desire to stand alone. Its fixed mode adds endurance to these qualities. Virgo is a cold dry (earth) sign. Its coldness shows its passive nature and its dryness its desire to stand alone. Its mutable mode adds versatility and a capacity to blend with its surroundings. Libra is a hot moist (air) sign. 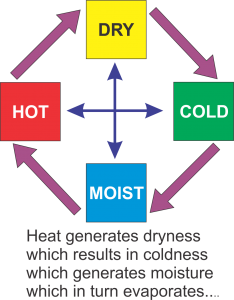 The moisture component shows the need to make connections with others and in the process consider their needs, and the heat shows the outgoing interactive nature. Its cardinal mode adds a pro-active nature to these qualities. Scorpio is a cold wet (water) sign. Its coldness shows its passive receptiveness and its moisture its desire to connect with others. Its fixed mode adds retention and endurance to these qualities. Sagittarius is a hot dry (fire) sign. Its heat show its active creativity and its dryness its desire to act without needing to make emotional connections. Its mutable mode adds versatility and a capacity to adapt to circumstances. Capricorn is a cold dry (earth) sign. Its coldness shows its passive nature and its dryness its desire to stand alone. Its cardinal mode adds a pro-active nature. Aquarius is a hot moist (air) sign. The moisture component shows the need to make connections with others, and its warmth shows its outgoing interactive nature. Its fixed mode adds persistence in exploring all possible ideas on a subject. Pisces is a cold wet (water) sign. Its coldness shows its passive receptiveness and its moisture its desire to connect with others. Its mutable mode adds versatility and a capacity to blend with its surroundings. Some authors also divide the signs into masculine and feminine; alternatively called active and passive, yang and yin, diurnal and nocturnal. These terms are very similar to the qualities hot and cold described above. They are also called ‘The Polarities’.